The Twisted Sisters have outdone themselves in providing clear and detailed directions for constructing a sweater. They have developed a system (explained in chapter 2) for capturing and mapping every possible measurement that you would need to design a sweater down to the half cuff circumference of a sleeve, and, step by step, they help you go from measurements to gauge to sweater parts to finished garment. The Sisters take this information in every possible direction too, including up, down, and side to side construction. They also include some wonderful charts and tips like suggested guages for various purposes. 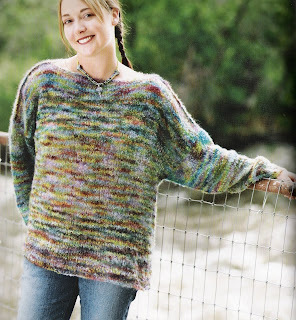 If, like me, you want to design your own sweaters and are good at following written directions (which most of us knitters are) you should condsider buying this book. I borrowed my copy from the library, and I am not going to buy it, and here's why: the Twisted Sisters designs make my eyes hurt. As hand spinners and dyers, I guess the Sisters are more interested in surface design of knitted fabric than they are in fashion and shape. But all of their designs have drop shoulders. They don't explain how to shape a sleeve cap or set in a sleeve. They have never heard of waist shaping. I may not be the most fashionable or shapely knitter out there (I'm not), but I try. 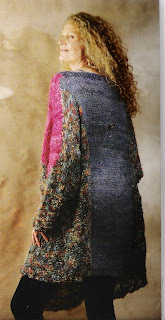 I don't want to knit bag-like sweaters (on purpose). I think the colors and neckline of the sweater in the lower photo are pretty, but check out those droopy shoulders and sleeves. In the upper photo, the Twisted Sisters love of surface design has spiraled out of control. This is the first Twisted Sisters book I have ever looked at. I think I might be more intereested in what they have to say about fiber and socks than I am in their design aesthetic.